Although absent from the music scene for many years, Phyllis Dillon is gradually making her way back into the business. 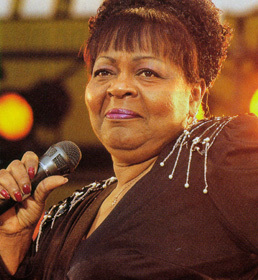 Dillon is still best known for the many classic rock steady sides she recorded for Duke Reid's Treasure Isle in the late 1960's. Her fans will be pleased to note that her current project is a recording that involves veteran musicians Lynn Taitt and Winston Grennan. I really enjoyed our conversation. As you will read, she is friendly, funny, interesting, and above all else, honest. Thanks to Phyllis, Lynn Taitt, Karl Mullings, Charlie Morgan and Jackie Watson. Before I ask you a little bit about the new project, I want to ask you about your earlier years. What part of Jamaica are you from? I'm from Linstead, in St. Catherine. Right in the middle of the island. I started singing from like school, at concerts, and at church. And then, as I got older, I started entering talent shows. And then I started singing with a little band in Linstead. The Vulcans, and we used to play over in Kingston, Ocho Rios, Montego Bay, like all over, because they were pretty good, you know. And it was at the Glass Bucket in Kingston I met Lynn Taitt one night. I was singing there, and he came over and complimented my singing, and asked me if I was interested in recording. And I said, 'yes.' Then he wanted to know if I had a song that I had written, and I said yes. So he said, why don't you come down to Duke Reid's studio, Treasure Isle, on Sunday evening, and let's see. And that is really how it started. Wow, I didn't know that. So Lynn actually introduced you to Duke. Right. Which was good, but bad. I think I understand what you mean by that. What year did you start working for Duke? That was 19... You know it was such a long time ago. My first record was in 1966. It was actually late '65, but it was released early '66. That song was "Don't Stay Away." Thank you. And that's the one I wrote, one of the few that I wrote. How come you didn't work for any other producers? How come you just worked for Duke? By the time I got, like . . . I wouldn't say 'smart', because I'm still not smart. By the time I realized what was really happening in the recording world, in Jamaica, I would not have gone to anybody else. Because, they were all the same - nothing was different. I mean, the guys from Beverley's were crying, the guys from Coxsone Dodd was crying, you know, Federal the same thing. So I figure, let me just stay with one thief, you know, this way I don't have to cry for everybody. (laughter) What kind of a man was Duke in those days? You got along well with him? Yes. I just didn't get money from him, but he was very nice. Because, I know a lot of people both respected and feared him at the same time. Yeah, I respected him for a while. I never feared him really, because . . . from what I saw there, if you did what you had to do, you didn't have any problems with him. A lot of people had nothing to do, but they would come to the studio and hang around. He didn't like that. That's understandable. Who were your favorite singers in those days? American or Jamaican singers? A lot of American singers. Yes, a lot of R & B. Well, if you listen to reggae music, it's like a big take off from R & B. Especially in the ska years, and rock steady years. So, those were the things I used to do, and would love to do right now, except that when I get a show to do, like a big show, it's usually a vintage show. And it has to be rock steady or ska.
. . . That's what you are known for. Did you sing many backing vocals, for any other singers, while you were at Treasure Isle? No. I did a couple of duets. Yeah, with Alton Ellis . . .
Yeah, and Hopeton Lewis. "Right Track," that's Hopeton Lewis, and we did quite a few more too. Most of them were not really popular. "Walk Through This World With Me," that's me and Hopeton. "Love Was All I Had," me and Hopeton, you know. They are nice songs, but they, for some reason, didn't take off. Yes and no. I guess. Maybe they just had a long life, because they are still around. I know you were also know for recording other peoples material, songs like "Perfidia." Who decided which songs you were going to record? Was that yourself, or was it Duke, or was that the musicians? Duke. Strictly Duke Reid. He called the shots. The only song . . . I remember I wrote a song, and took it to him. I want to record it. And he said it was too tame. Until this day, I don't know what he meant. The only thing I understood from that was that, no, it was not going to be recorded. What I had to do was take it back and change all the words in it, you know. And that song became "Rock Steady." He said it was too tame? Tame, yeah. It was a love song of course. It was too tame, so he wanted something wild. (laughter) I could not give him anything wild. I changed the lyrics, and then we called it "Rock Steady." It turned out to be a great song anyway. Yeah, I like "Rock Steady." Was Lynn involved in most of the sessions at Treasure Isle in those days? Yes. I really don't remember doing a song that he was not part of. Maybe 3 out of, like, 3 dozen or more. I've lost count. He must have been the busiest man in Jamaica in those years. He was so good at what he does, I was going to say 'did', but he's still doing it. He was very good at it, so naturally he was in demand. I don't think that there are too many people that are both fast and efficient. Which, I think, he had to have been. What about Winston Grennan . . .
Winston Grennan. I met Winston Grennan for the first time in my life two weeks ago. He, however, said he played on a lot of my songs. I was never introduced to him. I never hung around after the sessions to meet anybody. Because I'm from the country, so as soon as my session was over, 'bye.' I hit the bus, and I'm gone home. I've heard that he played on songs like 'Love Was All I Had', and things like that . . . Right, and he said he did "One Life To Live" too, among others. But, I could not remember him. But, by talking to him, I realize that he was there. But I just met him officially (laughter), the other day. Do you remember any of the other musicians from that time? Tommy McCook, Lloyd Knibbs . . .
Lloyd is still going strong. A friend of mine saw him in the States the other night, with the Skatalites. Really? Since I left Jamaica I haven't seen him, and that's like 30 years ago. I would love to see him. Roland Alphonso also, and I knew the great Don Drummond, I knew them all. Herman Marques, don't ask me what he played, he played a horn. Yeah, and my bass player . . . what's his name . . .
And somebody is still making money . . .
Of course, a lot of them are making money now off it . . . Your cds are still out there. How does that make you feel about it, when you see that your stuff is still out there. I'm sure in some ways it makes you mad, but in other ways it must make you glad . . .
No, I feel like I'm being used all over again. Because, they are making, God knows how much money off it, and nobody ever said, 'here's a dime.' And they all know where I am. Mr. Dodd is in Brooklyn, he knows I'm here. I spoke to him in Nagasaki, that's in Hampstead, a club, and he has money for me, and we have to get together and talk, and what . . . Why do we have to get together? You have money for me, you know where I am, send it to me. I think they like when you beg. And I going to die, you know, because I refuse to beg. Especially if it's mine in the first place, you know, I shouldn't have to ask for it. But, I wish them luck. I'm sad to say that almost everyone I've interviewed over the years has had a similar story. I know, and they are not lying either. I mean, I was in the studio with Alton Ellis, with Hopeton Lewis, with The Jamaicans, because they were the guys that back up "Rock Steady," vocal backing. I was in there with The Melodians, with even Dawn Penn. I was there one day, and she did a beautiful little song called "Bluest Blues" (singing) "This little boy of mine, well he broke my heart in two, all I want to do . . . " It's a pretty little song, but I pretty sure she didn't get anything for it either. That's the one thing we all have in common, we all got ripped off by the same people. Yeah, well I guess if there is an upside, ar least, even though it doesn't put money in the bank, at least you have the knowledge that you made something that lasted thirty-odd years. That's the only good thing, you know, that come. And I met some really nice people, but that's it. But, as you know you can't take that to the bank. Yeah, unfortunately not. That's the sad part. What year did you move to New York? I came to New York in December of 1967.
. . . and you still did a little bit of recording after that. Yeah, I used to go back to Jamaica. As a matter of fact I made the album while I was living here in New York. That's interesting. You started doing live shows a couple of years ago . . . I started . . . I had stopped singing, you know. Because I was singing with the Buccaneers, here in New York -- a Jamaican band. And I find out that the same thing was happening. We would go to Boston Friday night, Springfield Saturday night, Hartford Sunday night. And on the stage he would tell us that tonight is a charity gig, you know, that kind of slackness. So, I decided this thing is not working for me, so let me stop now. So I had stopped for almost twenty years. And then Michael Bonnet talked me into doing a show in Jamaica. Michael Bonnet. He was entertainment manager for the Oceana Hotel in Kingston. And he want me to sing, and I said, 'No, I can't sing.' He said, 'Yes, you can sing.' I said, well, 'I won't sing.' And he said, 'why won't you?' I said, 'Do you have time?' He said, 'Well, my boss gave x-amount of dollars, and I have six months to try and convince you to come.' (laughter) And he called me again after that and I said, 'You know, why not, let me go do it.' It was '91, and everything just come back, and I realized how much I was in love with that thing. So I started from there. Have you done some shows in New York and over-seas as well? I have done shows in New York, but they are not like big shows, you know, one or two. But I have gone to London, Germany, Japan. I did shows there and they were right out of sight. They were really, really wild! This is doing rock steady shows, with some of the other singers from your time? Yes. As a matter of fact, right now I'm waiting on a phone call, to pack my stuff to go to Europe. We are supposed to be doing France, Germany, Belgium and Spain, so far . . . It must be a little strange working with these people again after all this time. It is a little strange. But you know what? It's like fun. It's like living like a Gypsy for a while, and it really is fun. It eases the tension, and takes away the stress of everyday living. Once you are on tour, you feel like you are somebody else. You're not really you. And then, when you're finished touring, you come back home, then you have all the problems again. So, it's nice to get away once in a while. Sometimes it's not big money, but it's good money, you know. It's worth doing. At least I love doing it. Who approached you about doing this new CD with Lynn Taitt? Yeah. You see, my brother writes songs. He sings songs much better than I do . . .
(laughter) I find that hard to believe. Yes, he does. But he had these songs for himself. Lynn said he had some songs too, that he would like to have recorded. So I spoke to my brother, and he said, 'sure.' So, I took three of his, and I think four of Lynn's, and two of my old songs. And that's what I did. But it was Lynn's idea. So he played most of the music on this new project himself, I assume. I think so, yeah. I know he had guys with horns. And Winston Grennan played drums. But, I think he did the rest of it himself. So, how did it feel to be back in the studio? It was kind of strange . . .